The best design programs in the world include some of the top schools to study design. This list highlights the growing role they play in supplying creative managers to corporate and nonprofit organizations. Against the backdrop of a national expansion in cultural and creative industries, we hope to provide a multi-disciplinary learning environment. Through theoretical and empirical training, as well as creative and experimental practices, we aim to widen the students’ horizons and advance their personal development in the true understanding of culture and humanitarianism. Students are encouraged to push the boundaries of design by experimenting and integrating skills and principles from all aspects of design. In the future we’re continuing to upgrade international interactions in design education, such as the regular invitation of foreign visiting professors, student exchange programs and education-industry cooperation, and participation in design competitions and exhibitions to share its academic resources and research results with national/international academic institutions as well as industries and to provide students and teachers the best environment for study, research and creative endeavors. The new e-generation has reformed the way in which society views the world. In order to meet current social demands, we aims to offer a rounded education which will encourage students to challenge the boundaries of design through the exploration of fashion brands & design, animation & multi-media design, industrial & conceptual product design and architecture & interior design. The undergraduate program requires students to earn at least a total of 132 credits: 70 credits from the compulsory courses and 34 credits from the optional courses. The graduate program requires students to earn a total of 30 credits: 18 credits from the compulsory courses and 12 credits from the optional courses. The courses follow Shih-Chien University’s teaching and research mission, focusing on “multi-disciplinarity,” “praxis,” and “inter-disciplinary creation.” We complement these core ideals of the college curriculum with courses focusing on creativity, design, humanities, psychology, criticism, consumerism, and management. Professors tailor the classes to the specific needs and strengths of the students, creating an environment in which students work freely between disciplinary fields, also a new energy of collaborative innovation that brings students together from diverse disciplinary backgrounds and to share their professional knowledge and abilities in varying cross-disciplinary projects. Elective courses offer students the opportunity to choose their own area of emphasis within their major course of study, preparing them to enter into the competitive design industry. 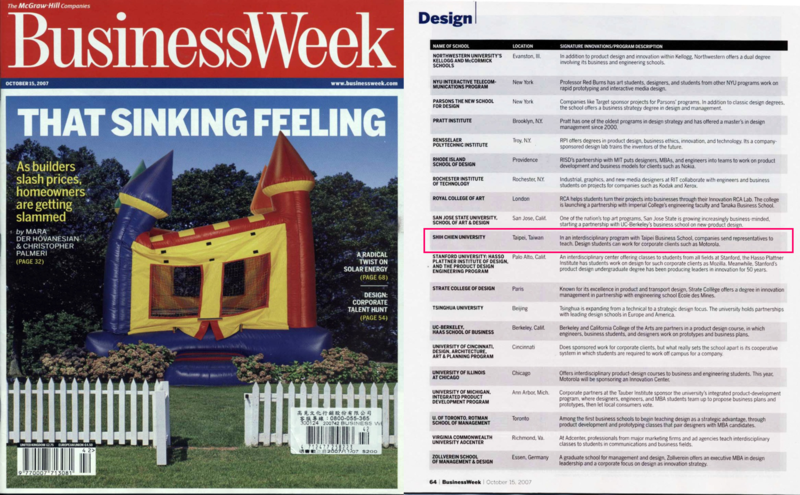 In 2007, for the first time college of design was selected as the best “Design Programs” around the world by Business Week US. Moreover, in 2009, the master’s degree program of Industrial Design was selected as “World’s Best Design Program” among 115 worldwide design schools. Undergraduate- students are required to produce an independent solo/group exhibition in YODEX(Young Designers’ Exhibition in Taipei World Trade Center) or in other appointed professional venue. Graduate- students are required to complete both a thesis and hold an exhibition of their work. We aim to focus on students’ intellectual and creative development, the program stresses the interactions between students and their professors, helping them develop their critical thinking abilities and encouraging their independent creativity and opening the door for deeper understanding of new global trends. We actively encourage student participate in international and national design competitions (for example: iF award, red dot award, OSAKA award, output student award…etc. ), organizing informational meetings to discuss the competitions and providing in-class guidance to students. Students have established an impressive track record in these competitions, winning over 2021 awards to date. Graduates continually collaborate with corporations including Microsoft, Mitsubishi, HTC, BenQ, FarEastOne Telnet, MaxMara, Nike, Estee Lauder, Levi’s, Converse, French Institute Taipei, SYM, B&Q, DGI, MSI, IPEVO, Seagate Technology, Samsung, Proton, Red Bull, Gamania, Loreal, FIJI Water, MUJI, Eslite Book Store Taiwan, etc., in co-sponsoring design competitions promoting their brands. Through these collaborations, students have had the opportunity to work with professional brand-name industries. We encourage international exchanges for students and faculty, providing partial funding for participating in international exhibitions, conferences, and performances. We have invited a range of distinguished artists and designers to hold workshops and lectures, introducing students to the latest trends in art and design fields and providing a forum for open discussion and debate.